Get your house sparkling clean for holiday guests—without the chemicals in many store-bought products—by making these simple, great-smelling cleaners. You’ll save a bundle over the long run, too. In a spray bottle, mix one part white vinegar, three parts water, and 5 to 7 drops of an essential oil of your choice from your local health food store. Lemon and lavender oils are popular scents—and have the added bonus of being naturally antibacterial and antifungal; thyme and lemongrass oils are also good for disinfecting. Can’t decide? Go ahead and blend a few essential oils to get your perfect scent. No mixing required! Simply rub stainless surfaces with a cloth dampened with a small amount of olive oil. Then repeat with another cloth dampened with white vinegar. 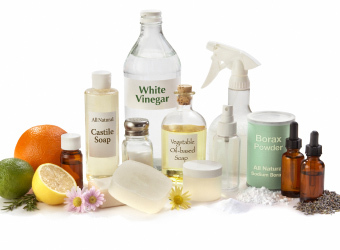 Mix baking soda, castile soap (available at health food stores), and 5 to 10 drops of essential oil in a lidded jar. (A recycled glass jelly jar is perfect.) The proportion of baking soda to castile can vary, but you want the mixture to be a thick paste. If the mixture hardens over time, add more castile soap. In a spray bottle, mix ¼ cup white vinegar, ½ teaspoon castile soap, 2 cups water, and a few drops of your favorite essential oil. Shake to blend. Dissolve ¼ cup baking soda in 1 gallon of hot water. Add ½ cup white vinegar and 5 drops lavender essential oil (or more, if preferred).